MTV is rolling out a new documentary series, "9 Days and Nights," that will capture the story of one artist at a turning point in their life and career. 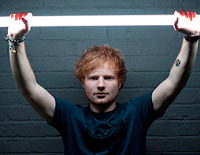 According to the network, the 60-minute documentary film will take fans inside the world of Ed Sheeran. With extraordinary, intimate access to Sheeran, this film will be a portrait of a young artist at a critical juncture in his life, filled with the energy of a career that he hopes is largely ahead of him. "9 Days and Nights of Ed Sheeran" will premiere on June 10th at 11pm EST.